DavidNews HYIP blog - News & Reviews: Market7 - Next Big One? Market7 - Next Big One? At the 5th May, Market7 was added to Golden Stage listing with $400 reinvestment. The project is still quite fresh, and it is online a little bit more than ten days. Overall the project seems professional, with a well-done design and offers investment plans where your profit will be included in the payments. When I added Market7 many people asked me - is this new Capital7? My answer was simple - of course, it is not new Capital7, but still some things are similar if we compare both projects. For example, one similar thing - Market7 has two similar investment plans, one is a daily plan, the second is "after plan" same as Capital7 had. Generally, of course, they are two different projects, but I hope Market7 administrator have some good intentions to run this project for a long period. One another thing that I like very much is that administrator is quite active when there is need to interact with investors. A number of newsletters certainly confirms that. It seems that brand-new newsletter is published like every calendar day. The administrator is not just active to send newsletters, but he is quite active on Facebook as well. Why is that good? It is good because when the administrator is working all the time with a project, there is a smaller chance that something will be missed or will go wrong. Sometimes chaos starts just when an administrator has walked away from the computer for few hours and because these days internet makes messaging lightning fast chaos spreads around very quickly. There are some other extreme cases when administrators launch a project, purchase monitors, blogs and leave it on autopilot mode, but of course, that is not the case with Market7. The project also has some nice promotional video that briefly explains main features of the project. Sure thing we have seen similar videos also in the past, but it is nice to have it just because it makes this project little bit different than others. On the main page, also you will find some brief statistics, but strange thing is that testimonials part is missing since the start of this project. 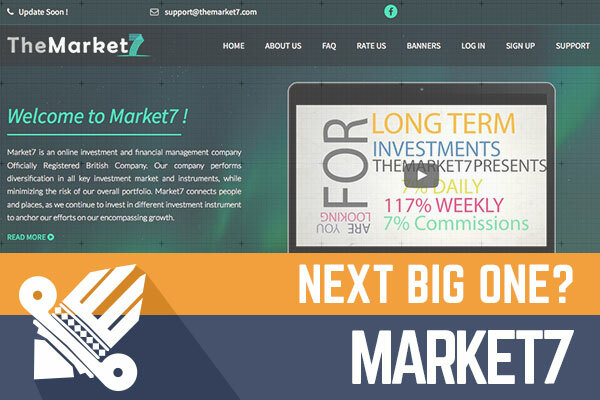 Overall I think that Market7 administrator is quite educated when it comes to marketing and he nicely develops this project. Only one thing that I would like to add - I would like to see Market7 also translated into Russian. It is no secret to anyone that biggest part of investors these days comes from countries where primary or one of the main language is Russian. Yes, I think that project is good, but remember do not invest more than you can afford to lose. Investment plans: 7% daily for 22 days, initial deposit included in the payments. 117% after 7 days, initial deposit included in the payment. If you're looking for the ultimate Bitcoin exchange company, then you should use YoBit. Double your claiming speed with this advanced BITCOIN FAUCET ROTATOR.